Only 26 per cent regularly read digital grocery flyers. And even those reading both print and online prefer the good old fashioned paper flyer, as attested to by 71 per cent of respondents. Perhaps it’s the portability and convenience of paper. Less than one in two carry the flyers into the stores. Flyers are more popular than ever with one in three shoppers saying they read flyers more than they did one year ago; only six per cent are reading less. And while flyers are available in stores most consumers prefer reading them at home ahead of time. Seventy five per cent prefer to check them at home versus 26 per cent at the store. The major reason for using flyers isn’t surprising. Ninety-two per cent say they’re looking for lower priced specials and 69 per cent want to compare prices between stores. Grocery flyers are read the most, followed by those from mass merchants and drug stores. Eighty six per cent read grocery flyers weekly compared to 69 per cent for mass merchants and 59 per cent for drug stores. Coupons remain as popular as ever. 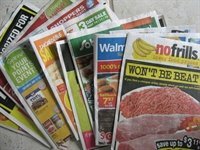 Six in 10 people use newspaper coupons at least once a month. But a similar number use coupons from envelopes delivered through the mail.